Your idea to burn the candle in the evening is fine -- but i would modify it to start the candle in the morning, let it go 15 minutes, then pinch it out (not blow it out) and burn the rest of the knob at night. I'd move the Lodestones a little bit each time. Many folks perform spells at 12-hour intervals rather than at 24 hour intervals. The most common timing of that sort that i used to be told in the old days was "nine at morning and nine at night." 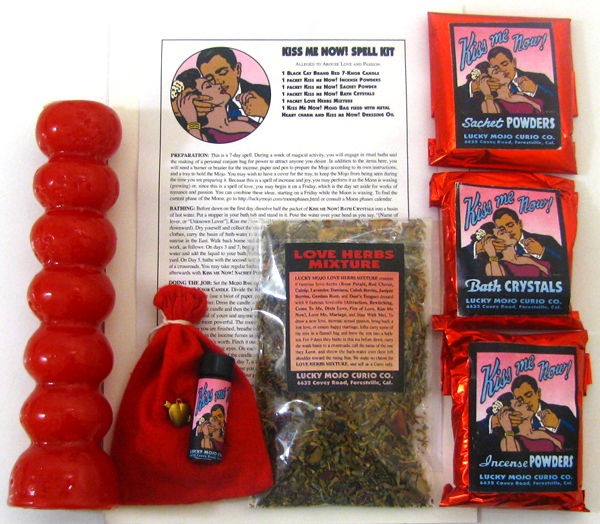 I am a man and wish to use the spell kit "Kiss Me Now" for a specific woman. I don't want to go the route of a honey jar as I understand that is very long term. Also, I am not looking for something permanent. Is the Kiss Me Now spell faster and more temporary? "Some nights you don't want to fall in love, settle down, or raise a family -- you just want to party and have a good time. There's nothing wrong with that -- and KISS ME NOW! will help you find someone to do it with! If you are looking for instant, no-holds-barred hugging, kissing and loving, use KISS ME NOW! and get yourself kissed!" So I would say yes to your question. You can purchase the Spell Kit below by clicking the 'Add To Cart' button below. while I want to direct the spell toward a specific woman. You can definitely altar that and aim it toward one target. I then took some Q-Tips and drained the liquid wax off using the cotton swabs. The candle then burned to completion quickly, within minutes, even as I was applying the final q-tip to the last of the liquid wax. I did not snuff the candle accidentally, I am sure; it simply burned to completion as I removed the liquid wax. According to the hoodoo tradition, does this constitute any negative interference with the spell results? I would think not. but I want to know the traditional view. Thank you. If anyone has any tradtional Hoodoo interpretations, I would very much be interested. 3. Finally, the Mojo itself: I carry this in one pocket and put nothing else in there. if anyone can offer any tips in caring for the Mojo from this point forward, I would appreciate your knowledgable comments from the Hoodoo perspective. I would call this interference by draining the wax. I let the candles burn naturally and then give me an interpretation in the remaining wax symbols ( unless I am getting negative signs, then I interfere by doctoring the candle to get positive results). Therefore, I would probably light another one and allow it to give you the symbols that it had naturally intended to do. For the first week, I carry it close to my skin: in my bra during the day and pinned to my nightgowns during the night. Some men carry then in the underwear. How can I avoid doing the entire rite again? Is there a way that I can dress, dust, and light a normal red candle and have it complete this rite? Also, am I to wear the Mojo all the time even if the person is distant? I bought another 7 day knob red candle in a shop here, and still have the KMN sachet powder and KMN oil to dress it. However, the Mojo is on my person now, and the incense is completely gone (burned completely). Can anyone advise how to fix this based on your Hoodoo experience? Can you please provide more detail how I would redo the candle aspect? Hopefully the whole spell has not been diminished by this. Are you asking how to re-do the 7 knob candle? Or are you asking how to use a different candle in lieu of that one? 2. Is it necessary or helpful to burn a second red, 7-day candle, dressed and dusted as prescribed, in order to reinforce or replace the candle which you seemed to imply was made ineffectual by my draining of the liquid wax. or perhaps you do not mean it was ineffectual, and in that case, I can leave things as is? Yes, carry on with the Mojo hand. And I would go ahead and start the second candle as a reinforcement of the spell (just in case is wasn't completed as spirit planned). I am not saying that the spell is ruined. although it could be). But am more concerned that it may be incomplete. Is there a particular way to address these spirits and call to their attention that I am re-doing the candle aspect of the same spell for which I am carrying the Mojo? The most effective way that I have found is to speak with love, kindness, respect, and humbleness.